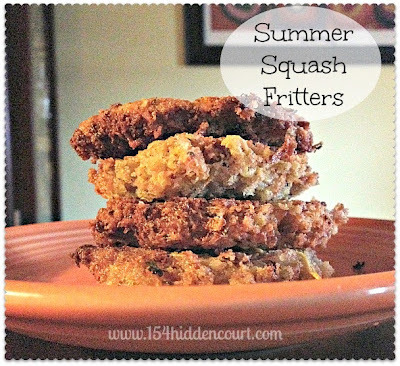 154 Hidden Court: Summer squash fritters. Every year at this time, I feel like I'm at the mercy of the kindness of other people with gardens. Luckily for me, a super rainy summer paired with milder than normal temperatures means EVERYBODY I KNOW IS GIVING AWAY SQUASH! Usually I just roast it with some olive oil and spices in a super hot oven for 15 minutes or so and call it a side dish, but something I was making for dinner the other day called for something different. So I whipped these little babies up in about 15 minutes. I loved them. R loved them. The boys ate them without complaining. WIN! Don't let the bad iPhone photo fool you - they really were super yummy. sea salt - or table salt. I won't judge. After grating the squash, place it in a colander or strainer which is over another bowl and sprinkle generously with salt. Allow it to sit for 15-20 minutes so the bulk of the liquid will drain off the squash. Meanwhile, begin to assemble the rest of your ingredients by beating your egg, then adding all the rest of the ingredients in a large bowl. After the squash is mostly drained, add it to your mixture and stir until it comes together. Heat oil in a large skillet over medium heat, and form the squash mixture into patties. Fry for 2-3 minutes on each side, until golden brown. Drain on paper towels before serving.